Make a donation to An All American Affair: The True Story of Maxene Andrews today. Film Independent’s Fiscal Sponsorship program opens the door to nonprofit funding for independent filmmakers and media artists. Donate today and help bring An All American Affair: The True Story of Maxene Andrews to life. Maxene Andrews, of the famed musical trio “The Andrews Sisters”, lived parallel lives. In the eyes of the American public, she was a beloved icon of 1940s patriotism. In private, she had many secrets that would have shocked America and destroyed the sisters’ careers and legacy. To the world, they were the BOOGIE WOOGIE BUGLE girls. But underneath all of the beautiful harmony and smiling salutes, the sisters struggled to balance their public personas with the many secrets they kept hidden from the world. Now Lynda Wells, a woman who stood by Maxene Andrews’ side for over twenty years is determined to set the record straight and tell the world the real story behind Maxene, and her two sisters. This project is still unfolding, and at the behest of those who knew and loved Maxene Andrews the most, the filmmakers have been asked not to publicly reveal the truth until the documentary is close to completion. Make a donation to An All American Affair: The True Story of Maxene Andrews. Amanda Spain has been a producer and director of documentaries and television for over 15 years. Recently she was honored to become a 2016 Sundance Producing Fellow. She is currently co-directing with Sandra Alvarez An All American Affair: The True Story of Maxene Andrews. She is also producing multiple projects including The Industrial Musicals Movie (executive produced by David Letterman and directed by Dava Whisenant). She recently produced and directed two short documentaries for ESPN’s acclaimed 30 for 30 series: Wrestling the Curse and Son of South Sudan (executive produced by Eva Longoria), which premiered at the LA Film Festival. She also produced and directed In Their Boots (executive produced by Robert Greenwald), which was nominated for an IDA award in the Limited Series category. Spain’s work has appeared on A&E, PBS, MTV, Link TV and The Sundance Channel and her films have been accepted into the Women’s International Film Festival and New Fest. In 2013 she started Giving Voice Films, a company dedicated to producing compelling documentaries for both the large and small screen. Currently, Sandra is co-directing An All American Affair: The True Story of Maxene Andrews with Amanda Spain. This past year, Sandra served as one of the directors of the Netflix Original documentary series, Turned On that premiered at Sundance in 2017. She also produced CNN’s documentary series The Nineties. 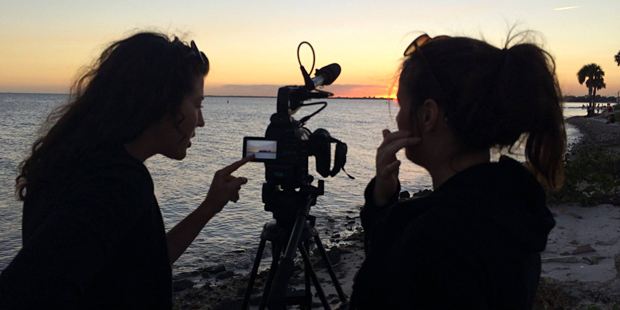 Sandra is currently working with producer Amanda Spain on the feature-length documentary A Secret Legacy, about a secretive CIA operation in the Congo in the 60s involving her Cuban grandfather.